Guys... Advent starts this week! I know right? Last week we were preparing for the biggest feast of the year, buying turkeys and baking pies. We were thankful. This week, we start preparing our hearts and homes for the birth of Christ. I'm not talking about putting up the tree and the Christmas lights. Those things are fine, but I'm talking about really living in the season of Advent. Advent is not red and green; it's purple. There are lights and excitement of course (Advent is not Lent after all) but we are trying to feel the longing over centuries of the chosen people for the Savior, and the deep longing in all our souls for Jesus. One of the best ways I have found to do that is to pray the St. Andrew's Christmas novena. It's rigorous. You are supposed to pray this prayer, including your intention 15 times a day from St. Andrew's Feast Day on November 30 until Christmas Eve. You can read more about the novena here. This year, I have created a lovely printable with the prayer on it. It's postcard sized so you can print it and easily put it on the fridge or display on a table. You could also fold it and send it to a loved one, maybe adding a note that you are praying for them with this year's novena. A few weeks ago, Mr. Pete and I traveled to visit my brother-in-law who has brain cancer. While we were there, we had the opportunity to pray at the cathedral in the Arch Diocese of Oklahoma City - Our Lady of Perpetual Help. The photo on the card is of one of the beautiful stained glass windows at the church. 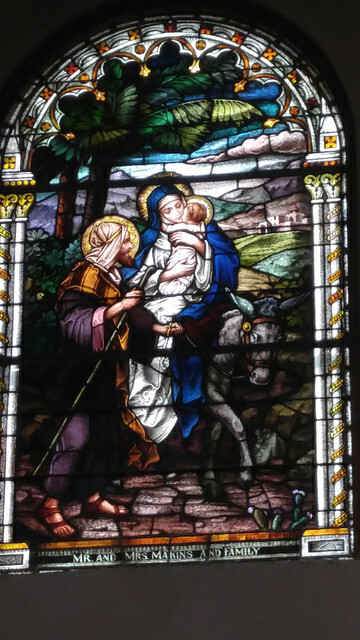 It shows the Holy Family as they are leaving for Egypt. I just somehow thought it was appropriate to have an image from Our Lady of Perpetual Help as we pray a serious novena beseeching Jesus through his mother Mary to answer our petitions. If you'd like one of these cards, they are free. Just sign up for my newsletter and be sure to respond to the confirmation e-mail. That's it.